Oblique aerial view of Rockcliffe, looking E.
Oblique aerial view of Rockcliffe, looking NE. 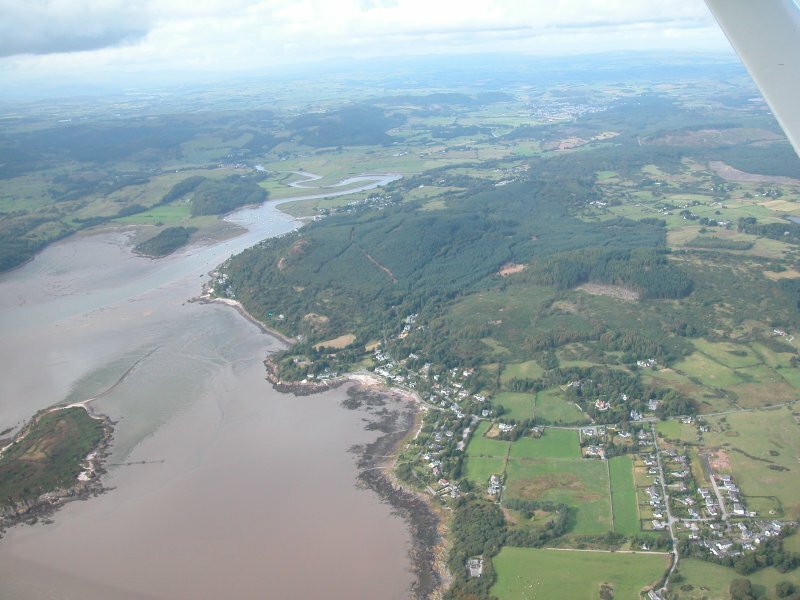 Oblique aerial view of Rockcliffe, looking ENE. 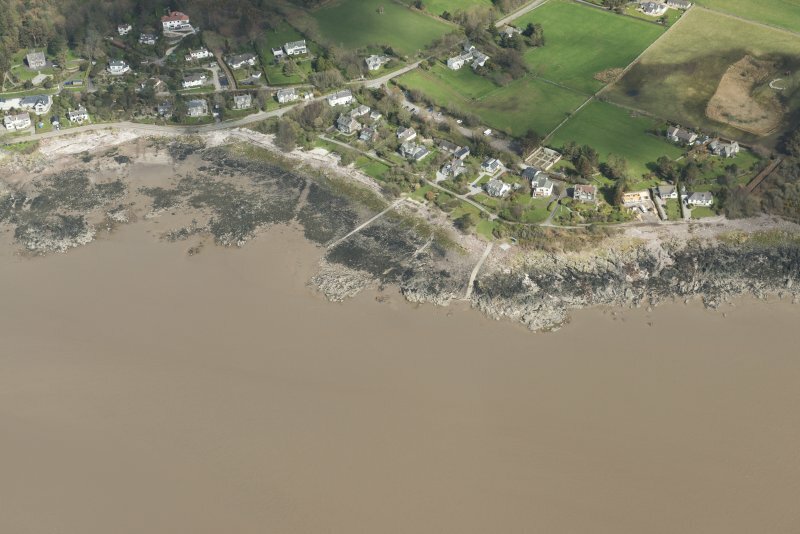 Oblique aerial view of Rockcliffe, looking ESE. 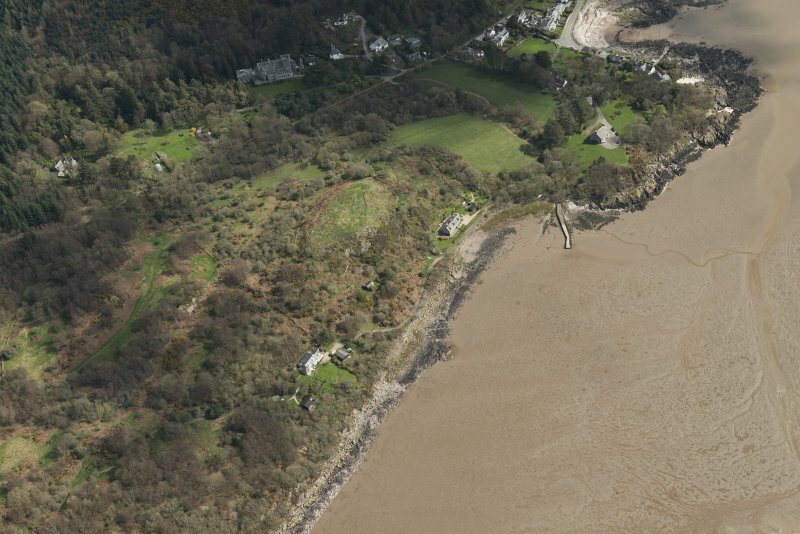 General oblique aerial view looking across the remains of the fort, with the Urr Water in the distance, taken from the SSE. (NX 8450 5403) Mark Mote (NR). 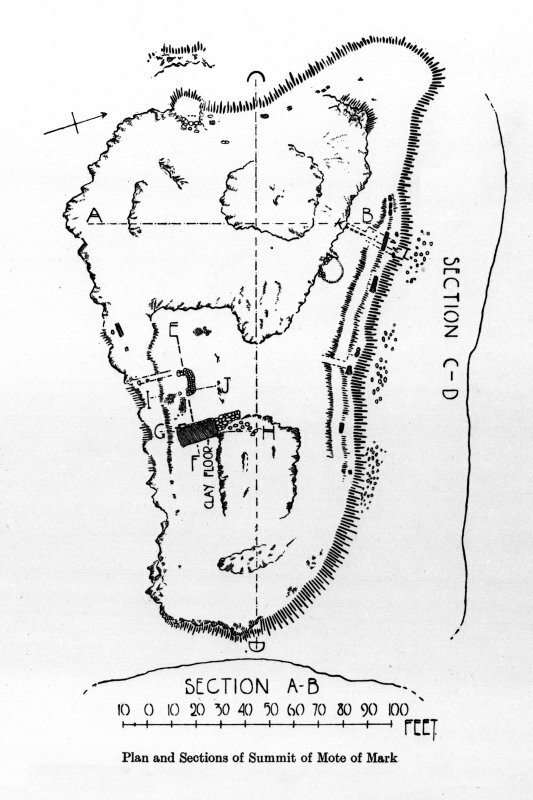 This fort, occupying the summit of a small rocky knoll and now in a very denuded state, is formed by a vitrified timber-laced rampart encircling the summit area, 270 ft. NW to SE x 55 to 105 ft. transversely. Along the flanks of the knoll, especially on the more accessible north side, lie masses of boulders, the ruins of the wall which encircled the summit. On the north flank, where there was a comparatively easy approach by an oblique track from the east, the material was probably sufficient for two walls. Elsewhere little trace of the wall survives. 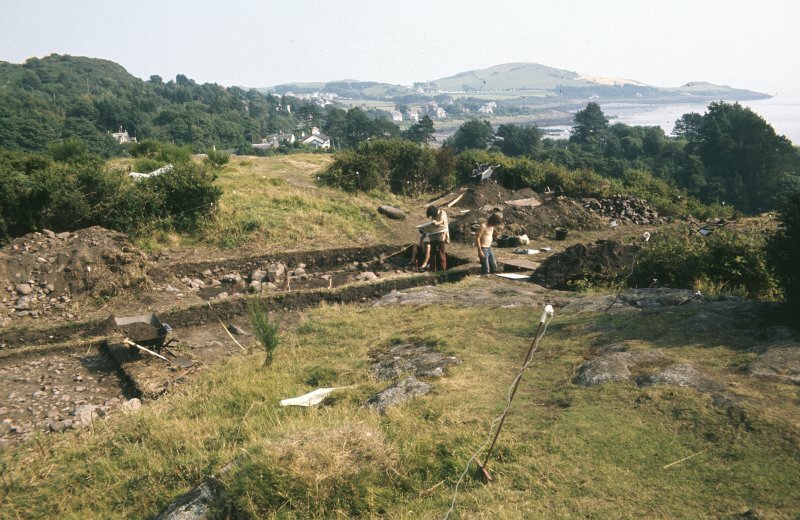 During excavation in 1913 two drystone huts were found and finds included over 100 late Larnian flints (dismissed by Curle in 1913-14 as probable strike-a-lights as they were found in the upper levels of the excavations, although he accepted they could be re-used prehistoric flints, a small piece of Samian ware and a piece of a mortarium; fragments of clay moulds for casting penannular brooches and ornaments of the Early Christian period, and pieces of glass of Mediterranean origin indicating a 9th c date. The Mote of Mark (National Trust for Scotland Name Board) is generally as described above although a second rampart now in the form of a terrace can be traced midway down the slope on the N and W sides. No trace of the huts survives. Classification of Roman material. Hitherto unpublished Roman glass from the site is now in NMAS. NX 845 539 A watching brief was undertaken on 30 August 2006 on the ground works associated with the installation of a cattle grid on the track leading to Ashlands and the Mote, Rockcliffe. 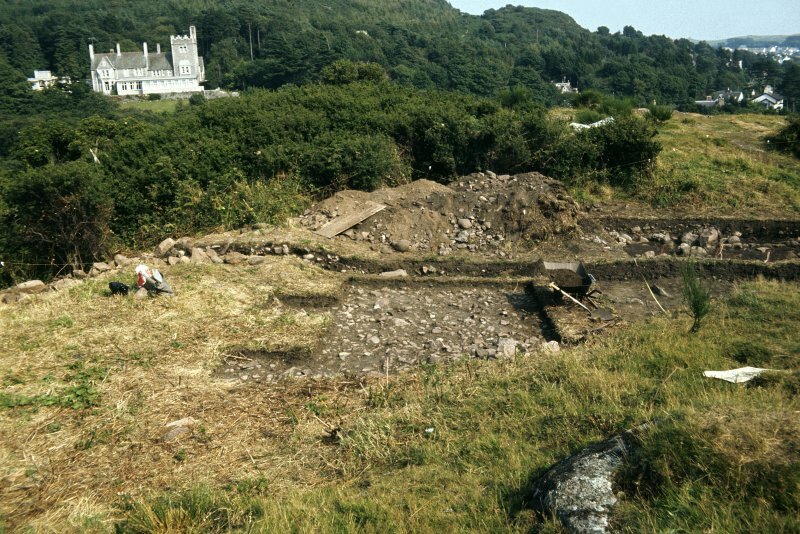 The excavations were at the foot of a rocky knoll surmounted by the remains of a 6th- to 7th-century AD fort known as the Mote of Mark, a scheduled ancient monument in the care of the National Trust for Scotland. No archaeologically significant deposits or finds were encountered in the course of the work. 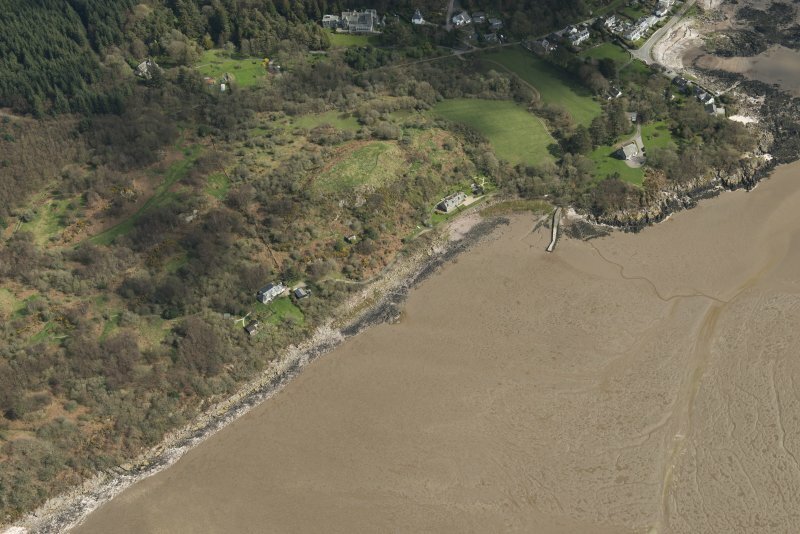 Occupying the summit of a low hill above the Urr estuary, this fort takes its name from Mark, King of Dumnonia, third party in the tragic romance of Tristan and Isolda. The association is a matter of legend, not of history, although interpretation of the archaeological excavations in 1913 and 1973 has shown that the site was occupied in the 5th and 6th centuries AD, broadly contemporary with the historical Tristan, and that the structure and artefacts were indeed of princely character. It was a citadel of some importance which lay within the British kingdom of Rheged and was destroyed in the 7th century, perhaps by Northumbrian Angles. The hill is steep-sided and craggy to seaward, but more gently sloping on the landward side. The summit is undulating and consists of a pair of flat-topped rocky eminences with a natural soil-filled hollow in the middle. Around the edge there are the remains of a wall, now a low bank of stony debris incorporating pieces of heat-fused granite but originally a massive rampart of timber-laced drystone construction about 3m high and 3m thick. It had two entrances (on the south and north-western sides), and the central hollow, evidently the main area of occupation, had its own protective wall. The main rampart was fIred by attackers, presumed Anglian, in the early 7th century who caused the stonework to become vitrifIed. The defences were later shored up with rubble, but these were soon dismantled and the site subjected to a final phase of squatter settlement. The picture presented by the assemblage of artefacts is of a community which included metalworkers and jewellery-makers using crucibles and clay moulds for casting bronze objects. Among their products were brooches decorated with early forms of Celtic interlace; scraps of decorated glass, possibly from the Rhineland, were also used for inlays and enamels. Glass beads, jet objects, and quantities of pottery from the Bordeaux region were also among the fmds which are now in the RMS. Here indeed is rich testimony to the life-style of the chieftains or princes of this fortified court, and to the workshops and craftsmen who served them. whilst on the S side this merely reddened and degraded. In places the rampart sealed traces of occupation, including bone, slag and glass: these identified the earliest datable phase of occupation to as early as AD 550, although it is thought that occupation debris sealed by the rampart probably immediately predates it, rather than representing a prolonged period of activity; hence dating the rampart’s construction to the second half of the 6th century AD. including imported continental glass, wheel-thrown pottery (including two unassociated sherds of Roman pottery) and large quantities of animal bone. Curle’s excavations in the southern part of the central hollow located the focus for the metalworking. 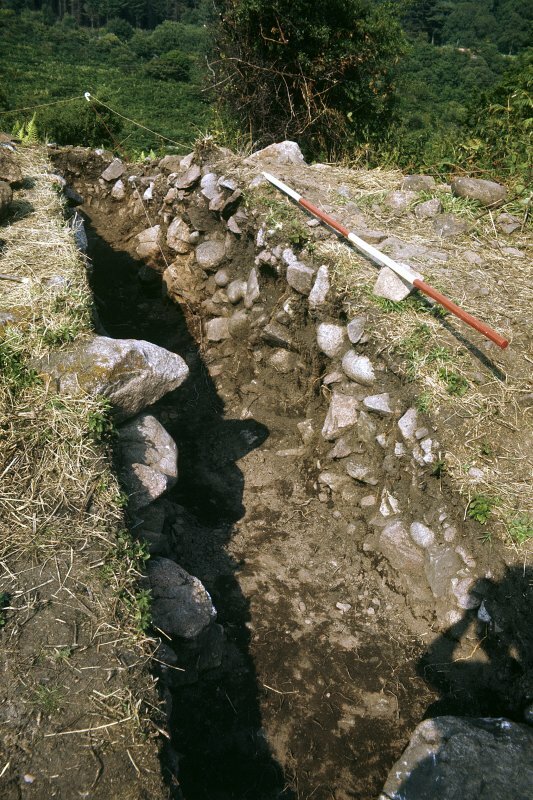 Here a three-sided stone-built structure was found, containing a loose, sooty, grey-black soil: this has been interpreted as either a bench or a revetment for a hearth, which later became used as a substantial midden area. 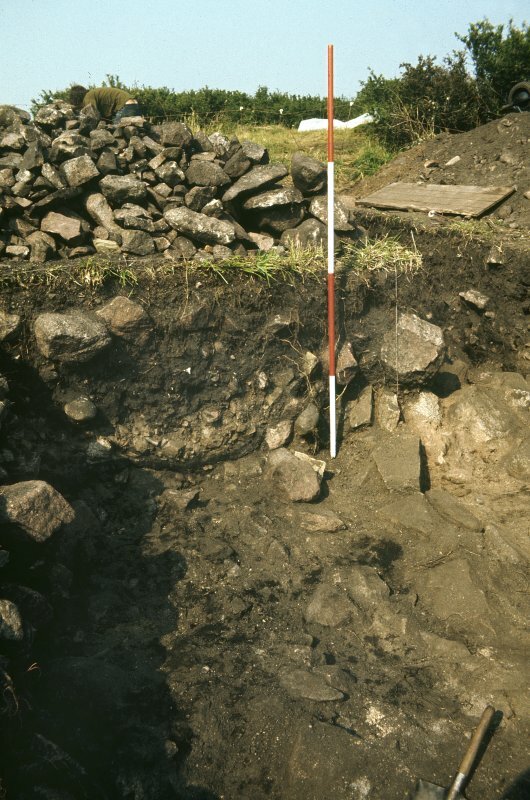 Beside the stone structure was a large spread of clay: Curle interpreted this as a floor surface, however it has been subsequently interpreted as the clay used in the construction of the moulds, especially considering this lay nearby two spreads of pure sand, which suggest further industrial uses. centuries AD. Even the two pieces of Roman amphora and sherd of D-ware suggest a mid-6th century date, and so prove to be contemporary with the ‘main’ phase of occupation. later 7th century the hill was attacked, and the defences burnt. Following this attack, the site fell out of use. existed to France and Continental Europe over 1400 years ago, and that the notion of a total collapse into anarchy in the wake of Roman withdrawal from Britain is erroneous: people still required and traded in fine goods, and craftsmanship was far from lost. However, the vitrified rampart may still show that whilst sophisticated, the political and cultural groups that occupied Britain were still more than capable of warfare when required. Generally appears to be in good condition. Slight wear on footpaths, with informal footpath made at N end of site. Heavy vegetation noted where excavations were carried out. end overlying a mound 11m in diameter, which in turn is on the line of a bank continuing the natural escarpment of a terrace around its SW arc. The hut is 11m in diameter over a 3m wall incorporating outcrops at NX 84545401, at the N end of the terrace described by Coles PSAS 1893, 92–6. This terrace, from which there is an incline to the fort entrance, is currently concealed by bushes, but where accessible there are cross-walls and perimeter walls which may relate to the fort’s defences. This fort occupies the summit of an irregular rocky hillock on the eastern shores of the Rough Firth. Shaped like a boot, with its toe pointing to the north, the irregular interior measures about 67m from NW to SE by a maximum of 32m transversely. The rampart can be traced round the margin of the summit, though it has largely collapsed into massive screes of rubble that can be detected on NE, S and W flanks of the hillock. Where excavated on the NE and S (see Laing & Longley 2006, 7-13), the rampart measures about 3.7m in thickness, and on the NE the scree of rubble on the slope below was over 1m deep; while most of this material denotes the massive scale of the rampart on the summit, it is also possible that it masks an outer rampart, particularly on the NE and W where other breaks of slope may indicate a second line of defence. No trace of an entrance can be seen and none was located in the excavations conducted here in 1913 (Curle 1914), 1973 and 1979 (Laing & Longley 2006). 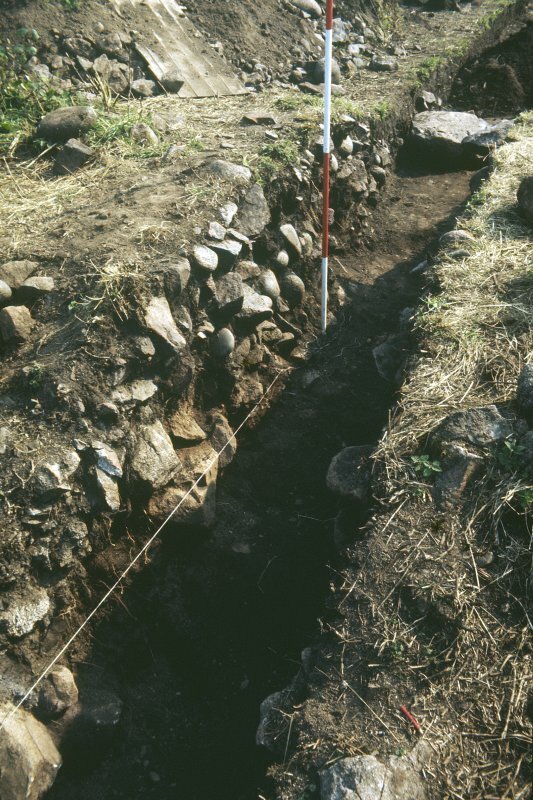 The excavations provided evidence of occupation in the form of hearths, bone and numerous artefacts (Laing & Longley 2006, 14-24) and there was also extensive evidence of metalworking, including iron, copper-alloy, gold and silver (Laing and Longley 2006, 25-74); a possible post built rectangular building was located but little evidence of floors or other structures. Finds include Mediterranean glass and pottery imports dating from the 6th and 7th centuries AD, and various moulds and manufactured artefacts of the same period. 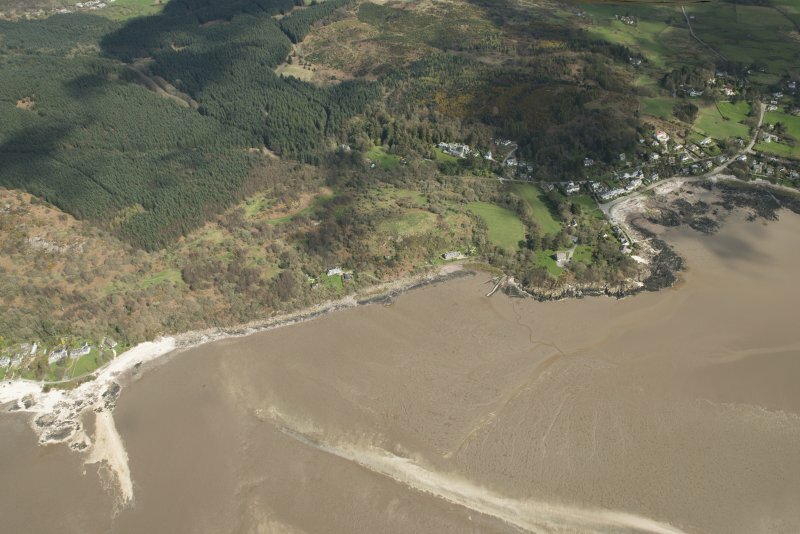 There are also five radiocarbon dates from rampart timbers with calibrated ranges spanning from the late 4th century to the early 7th century, but a sherd of E ware probably of early 6th century date and a fragment of 6th/7th century glass from pre-rampart contexts indicate that the defences were constructed in the latter part of this span, probably towards the end of the 6th century (Laing & Longley 2006, 24). NX 8452 5399 The cross walls and perimeter walls (DES 10, 54) on the terrace SW of Mote of Mark were examined in early November 2013, after bracken die-back. A bank or rock ridge runs along the rear of the terrace in a shallow curve 50m long. A cross-contour rock ridge runs out from 12m NW of the end of this curve, for 35m and a further 15m at a lower level. The platforms lie NW of this within the curve. They comprise a platform 15 x 5m cut into the slope, and slightly lower another 10 x 5m. 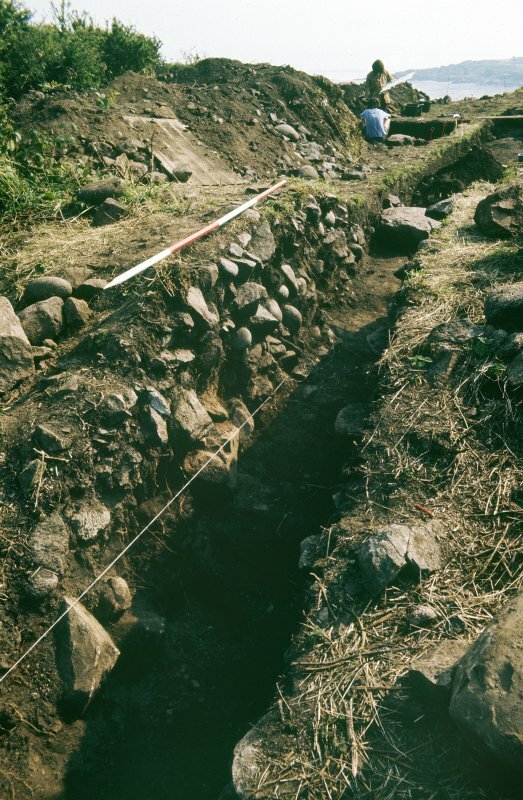 A ridge or bank perpendicular to the curved bank, 12m long, divides these from a third platform 10 x 7m to SE, cut into the slope, with possible 2m wall footing on SW. Below these is a 2–3m terrace, possibly an access track, which passes through a gap in the cross ridge, E of which it appears to turn steeply downhill. The hut lower downhill to E, described in 2009, more accurately at NH 8454 5398, is 20m across, including rock components, and probable stone clearance, and only 6m in diameter internally. With adjacent scarps it appears to restrict access to the terrace. It is not certain whether these features are contemporary with the fort or a much later homestead.